Vanuatu is located in the South Pacific. Vanuatu is an archipelago; this means that the nation is made up of a large group of islands. In this case there are 83 islands, 65 of which are inhabited. The volcanoes have been created by volcanic activity, some of the volcanoes are currently active and there is always a danger of a major eruption. 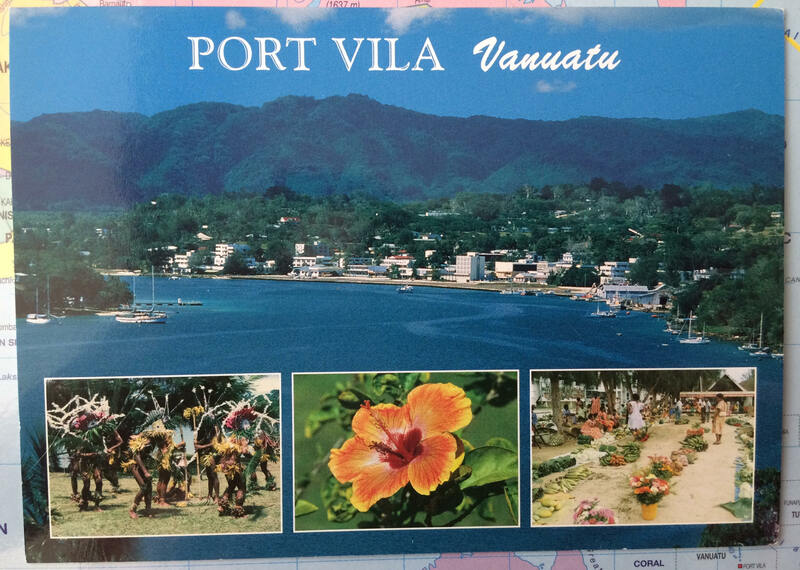 The capital city is Port Vila, on the island of Efate. Most of the land is steep and relatively unstable, and lack of fresh water is a growing issue as the population of Vanuatu increases. The climate is tropical with warm temperatures and rain throughout the year. Unfortunately Vanuatu is vulnerable to tropical storms, or cyclones, which cause extensive damage, injury and death. Due to the volcanic activity on the island there are also frequent earthquakes here. As well as its vulnerability to these natural hazards, Vanuatu is also at risk of the impacts of global climate change, specifically rising sea levels and ocean acidification. Previously a colony of Britain and France known as the New Hebrides, Vanuatu gained independence in 1980. The economy of Vanuatu depends upon agriculture, tourism, off-shore financial services and fishing. The economic development of the nation has been slowed due to its remoteness, the frequency of natural disasters and the reliance on a relatively small number of exports. The human development index (HDI) is 0.597, and is increasing. Pacific Islanders are not just standing by as global climate change threatens their land and sea. Communities are working together with official bodies to monitor changes in the ecosystem. For example, the RESCCUE Project, which has just recently launched their Marine Monitoring Toolkit. You can read more about the project, and other work by the Climate Change and Environmental Sustainability Programme (CCES) here. This photograph shows residents at the temporary evacuation centre of Lone, in western Ambea, before they are evacuated to a neighbouring island. Notice the grey ash weighing down the leaves of the trees and the black sands of the beach in the foreground. For more on this story check here. Vanuatu is truly a fascinating country. On the one hand, it is an idyllic holiday destination, and on the other hand, it is also one of the most dangerous countries in the world to live because of its vulnerability to natural disasters. Governance is difficult because of the sheer spread and remoteness of some of its islands that make up the country. I have lived in Port Vila for 3 years now and it has certainly been an adventure!